Neeson stars as Nels Coxman, a humble snowplow man, husband and father who, when we first meet him, begrudgingly accepts an award for Citizen of the Year in his small town of Kehoe, Colorado. Soon after, he learns his son has died of a heroine overdose. Unconvinced that his son was a druggy, Nels learns from one of his son’s friends that he got caught up in something he knew nothing about. Now, in typical Neeson fashion, it’s time for Nels to find his own “hidden set of skills” and hunt down the drug runners who killed him. Let’s start with the good. Director Hans Petter Moland chooses a different type of style with this film, as he does what he can to make the film super realistic. And when I say realistic, I mean, there are scenes and encounters that feel as if you’re watching a homemade video; not because of the way it was shot (though at times the cinematography can be a bit dark and amateurish), but because of the awkward performances and the how Moland portrays the action sequences. But there’s a reason most films subvert realism — make it too real and it can quickly become tedious. It doesn’t help that Moland doesn’t seem to know how to properly build character and a cohesive story that not only makes sense, but stands out among everything else that has come before it. I’m not sure if it’s because Neeson has done the same thing several times now already, or because Moland tries to do too many different things to look “smart”, but Neeson appears incredibly bored and tired through most of the film. It doesn’t help that the film doesn’t ever connect in the way it hopes, mostly because there’s no reason behind anything. There’s a writers adage that says that if a scene doesn’t either move the plot forward or develop the characters in some meaningful way, than it should be cut from the narrative. If that were the case here, the movie would be about thirty minutes. There are very few actions taken by any character that have any purpose within the context of the movie. At one point, Nels is ready to commit suicide, but nothing before this tells us anything about why he would go to that extreme over the loss of his son, especially when his wife (Laura Dern) is there to share in his pain. Speaking of his wife, she begins the film as a typical wife and mother, but begins to spiral after her son’s death, unable to comprehend how she missed such an important aspect of her son’s life. Eventually, after Nels begins his murder spree, spending the majority of his free time working his way up the chain in the drug organization, she leaves with no explanation or reason. And from that point on, she’s basically forgotton, as Nels doesn’t seem to care much that she did. He just continues on with his life as if she had never been there in the first place. She’s a ghost (wait… was she a ghost, like literally?) and it’s just one of the many odd developments that Moland lets play out. With all of this, their son seemed to be an extremely important part of this couples life and yet we never see that connection at any point int he film. What’s even worse, instead of relying on his main character to drive the narrative, Moland spends an awful amount of time on other things that have no purpose to the narrative whatsoever, including the addition of a turf war between the main drug organization and an Indian tribe. Yeah, it plays out in the end to help our supposed hero, but at the same time, it takes away any satisfaction or finality we may have had had the tribe angle never been introduced in the first place. So, what was the point of having them, exactly? Yet another question comes in the form of how Nels even gets his “particular set of skills.” Is it from a crime novel, as he portends? Or maybe it’s from his brother, which I never made any connection to until Moland uses him as a red herring of sorts to prolong the film. We’re also introduced to a pair of cops (John Doman and Emmy Rossum) that have absolutely nothing to do except bicker at one another and tell us what we already know. If you were to remove any of these characters, it wouldn’t change the movie one bit. So, what was the point? 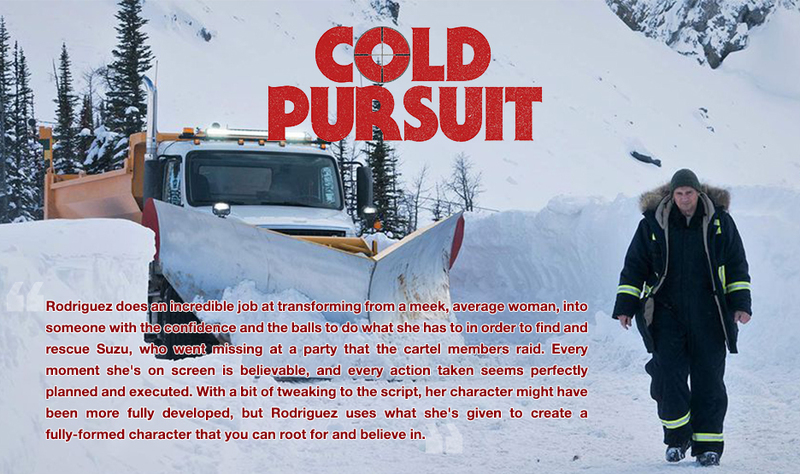 As you can see, that is the question we all have to ask ourselves about Cold Pursuit. What was the point? I’m not sure anyone working on the film actually knows, since nothing is ever truly resolved, the character interactions make hardly any sense, and by the end, much like real life, it just ends with no rhyme or reason. Is that what Moland meant to say in his own eccentric way? Will anyone care enough to find out? Next week, new movies include Alita: Battle Angel, Happy Death Day 2U and Isn’t It Romantic. If you would like to see a review for one of these, or any other film out next week, please respond in the comments below. This entry was posted on February 10, 2019, 5:58 pm and is filed under Entertainment, Film, Movies, Reviews. You can follow any responses to this entry through RSS 2.0. You can leave a response, or trackback from your own site.